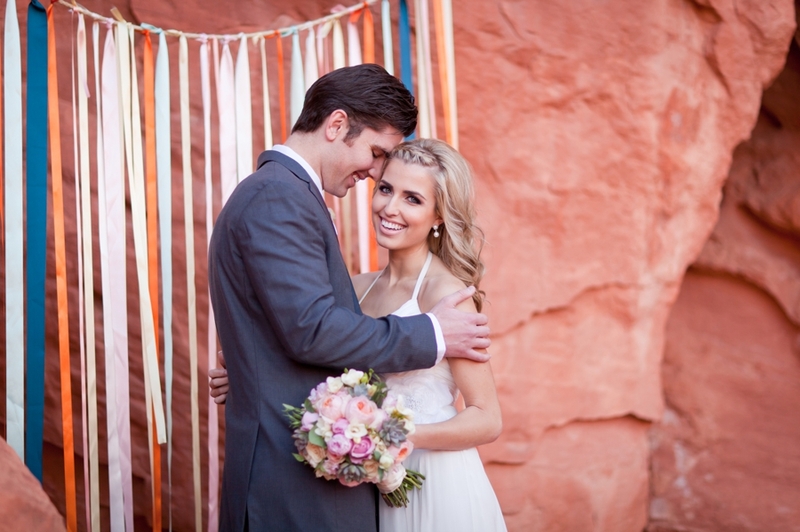 These high school sweethearts have been the sweetest couple to work with! 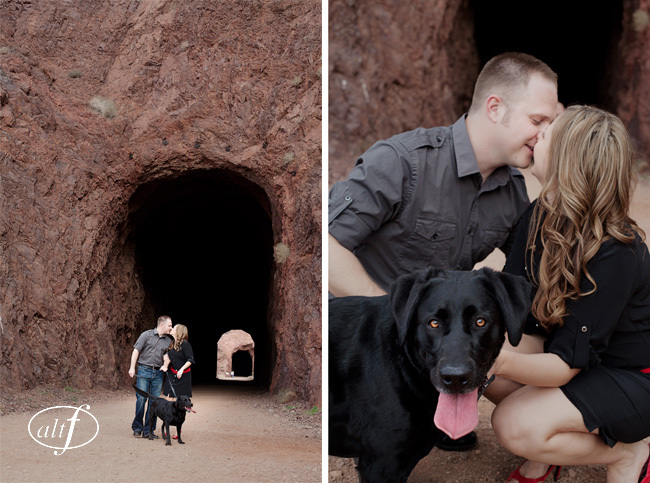 We cannot wait for their September wedding at the Springs Preserve. 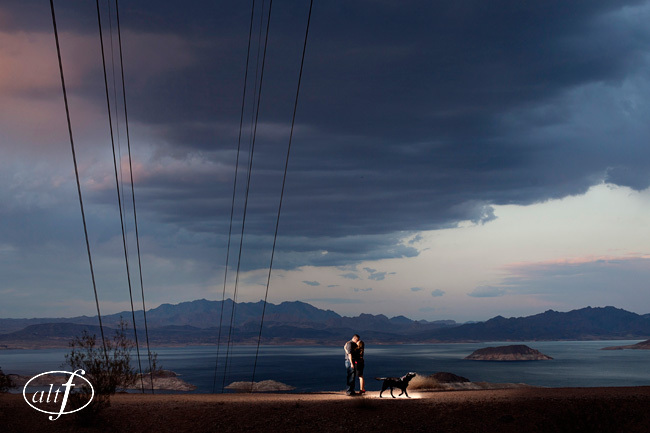 Ben proposed to Andrea on a day out at the lake with their dog, Roxy. So it was perfect that she made an appearance in their photos. 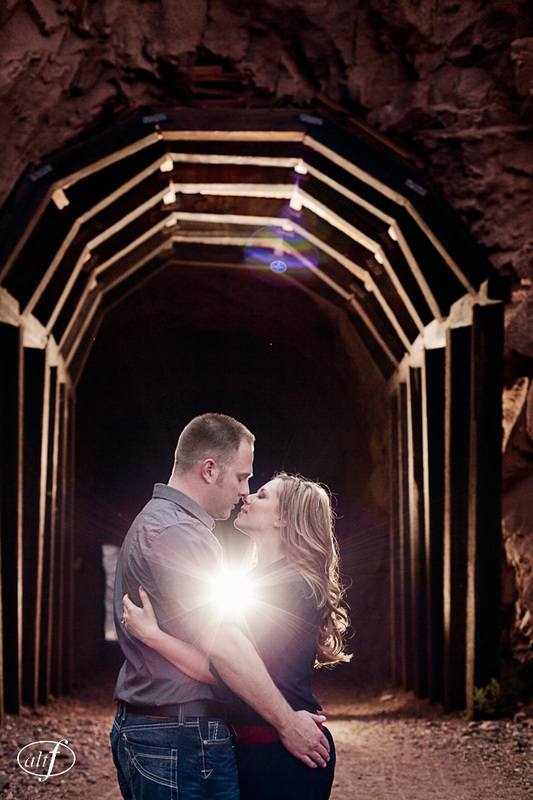 Take a look at their seriously gorgeous engagement session with Altf Photography. 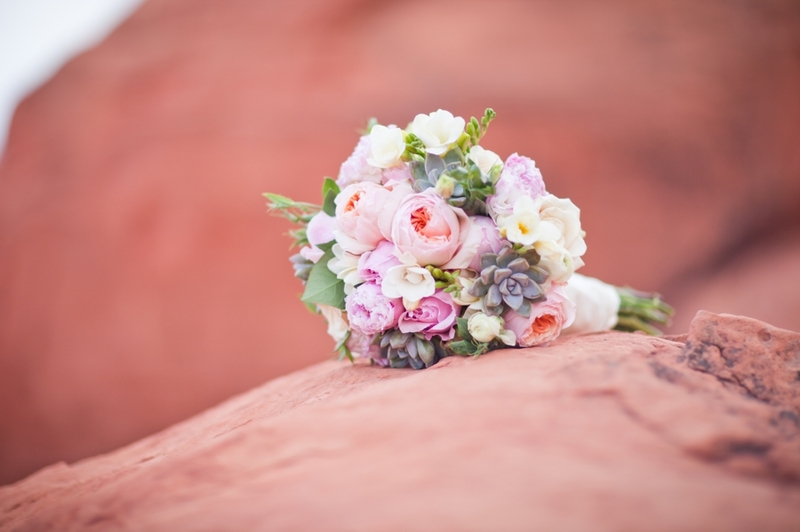 February has come and gone which means another WPPI convention has brought thousands of photographers, videographers, bloggers, suppliers and wedding planners from around the world. 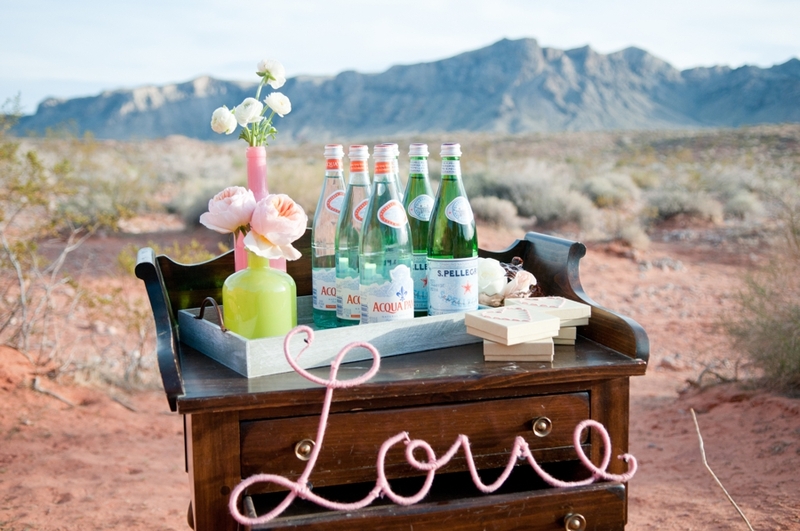 We love WPPI because it gives us the opportunity to participate in styled shoots for the eager photographers in town. 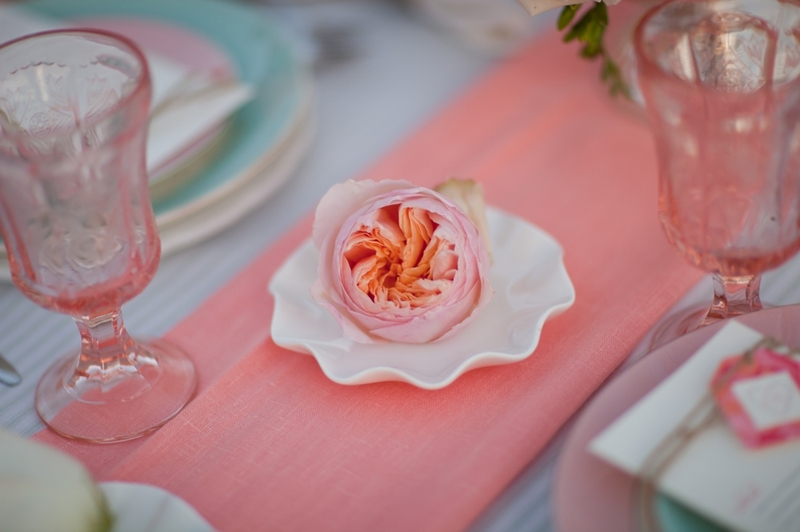 See last year’s red, white and blue shoot held in an airplane hangar here. 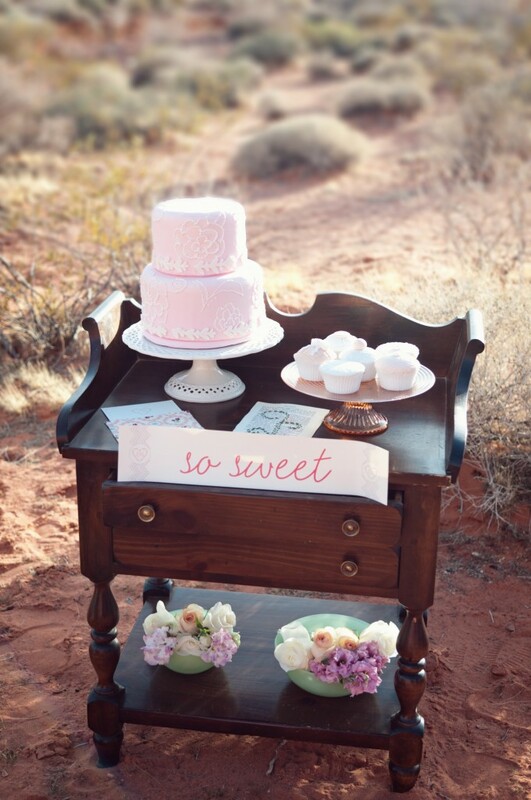 This year, Brittany Hansen of the super gorgeous Brushfire Photography contacted us about a shoot she was arranging. 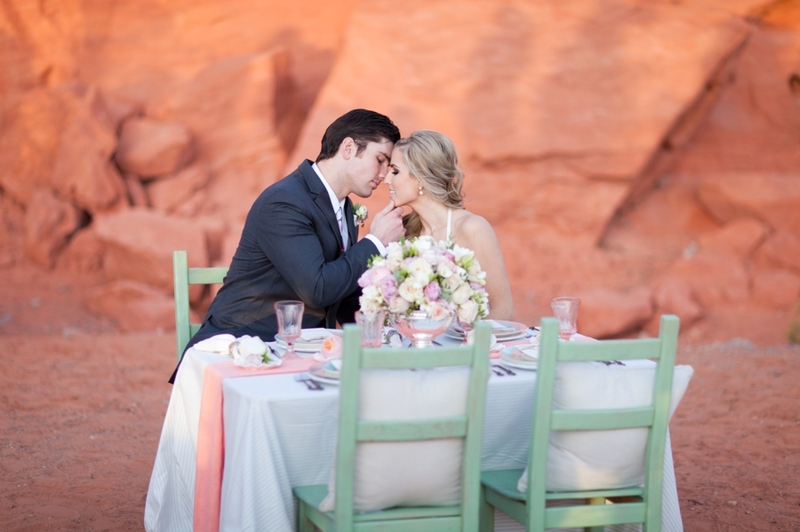 Brittany had the vision of a beautiful Valley of Fire Styled Shoot for a wedding with vintage touches. 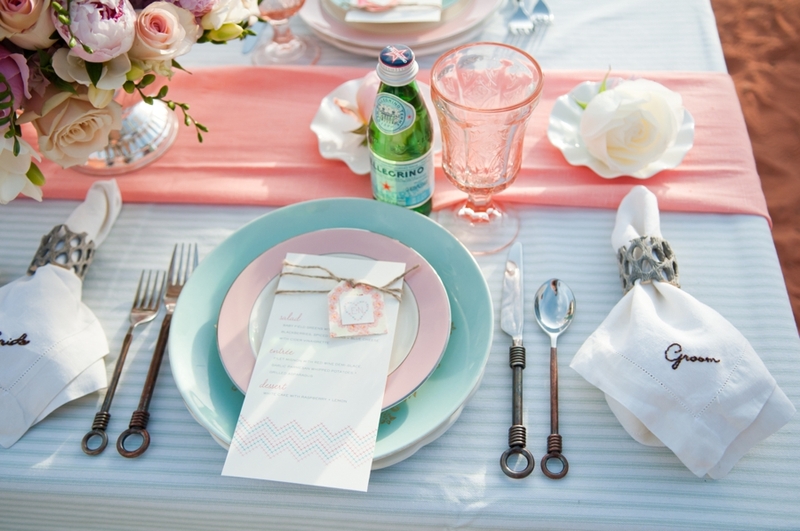 She gave us some colors, themes and ideas then let us run with the design. 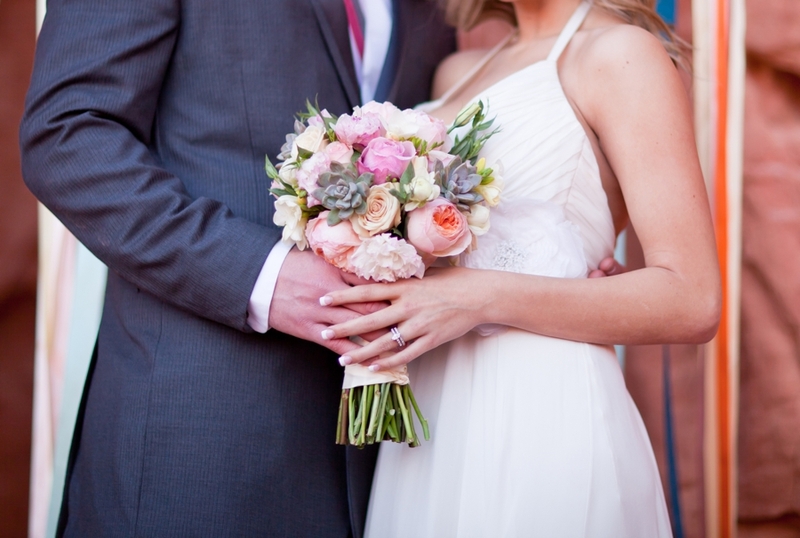 It’s kind of our dream come true and one of our very favorite parts of our jobs! 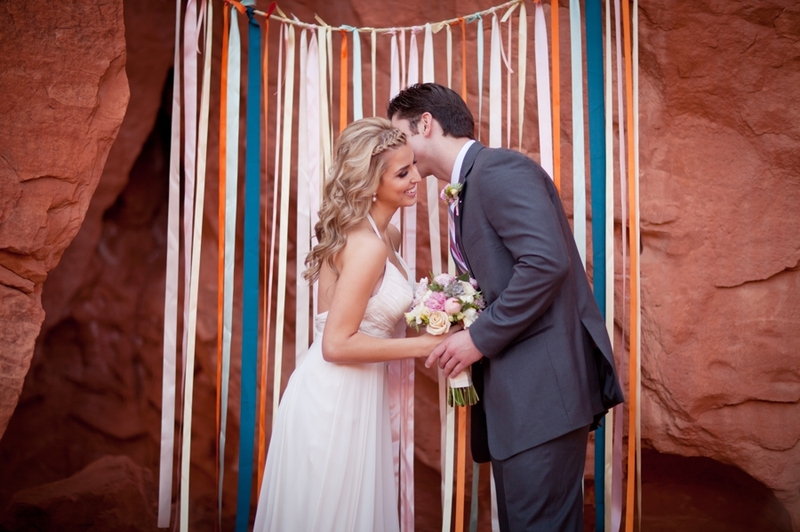 Brittany created a darling ceremony backdrop of hanging ribbon and set it up right in Seven Sisters at Valley of Fire. 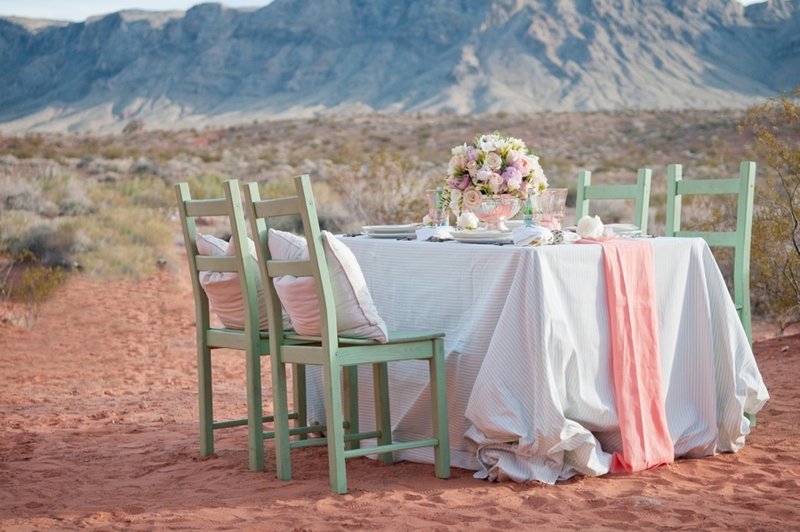 We designed a mint green and coral table scape with customized chairs and vintage table settings. 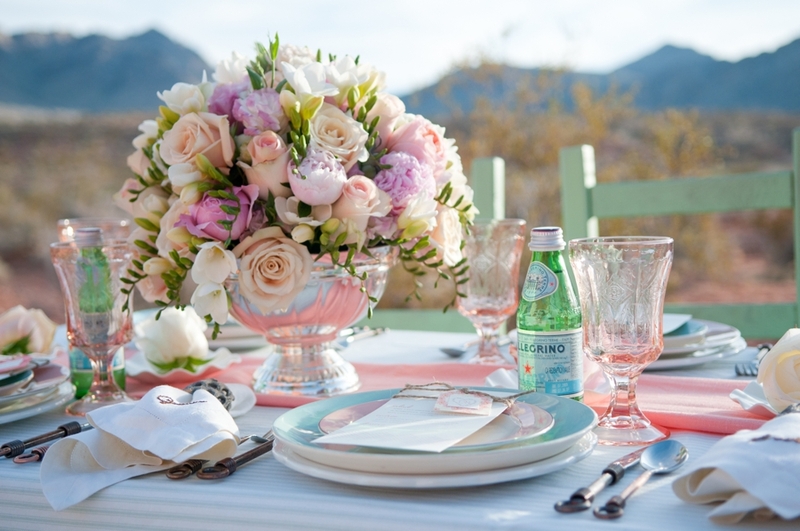 The colors perfectly complemented the greens, reds and pinks Mother Nature provided in the desert. 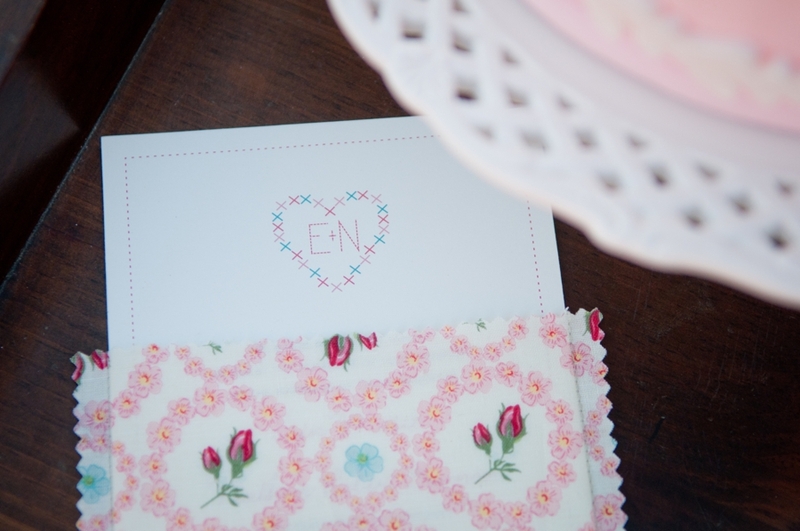 Sewing, stitching and embroidery details were included in the stationery, hand sewn favor boxes, napkins and yarn wrapped LOVE letters. 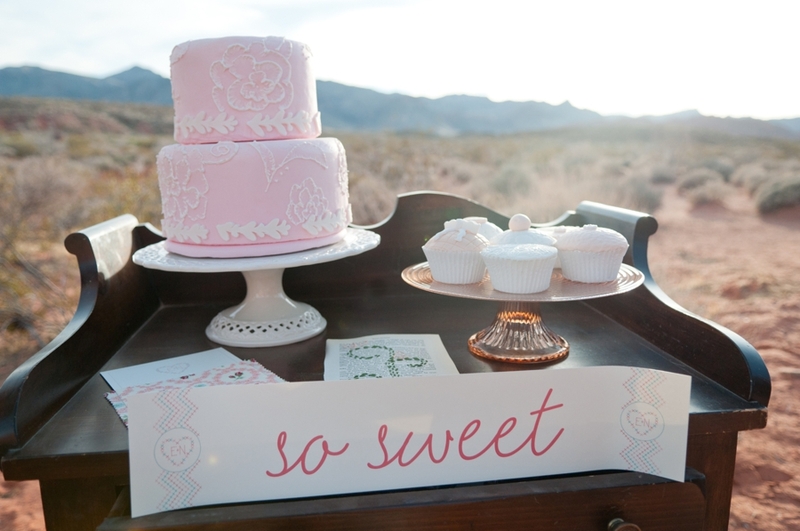 A pink cake with pink and white cupcakes filled the Sweets table. 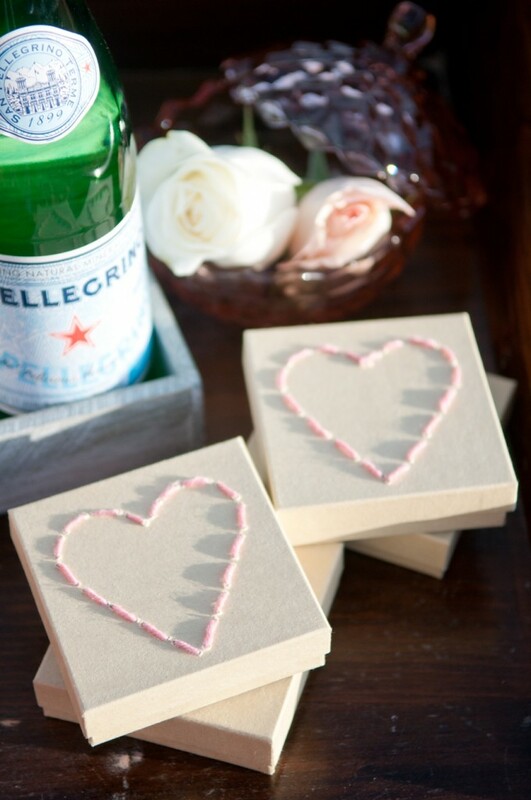 Calling all couples married in 2007 or later, or those of you engaged couples in the throes of wedding planning. Liene Stevens of Think Splendid is conducting a survey of couples and we’d love your participation. See, we think Liene is kind of a big deal and we know you’d all love her as much as we do. Help represent Vegas couples! The survey is anonymous and only takes five minutes to complete. Click http://bit.ly/wed2012 to participate. 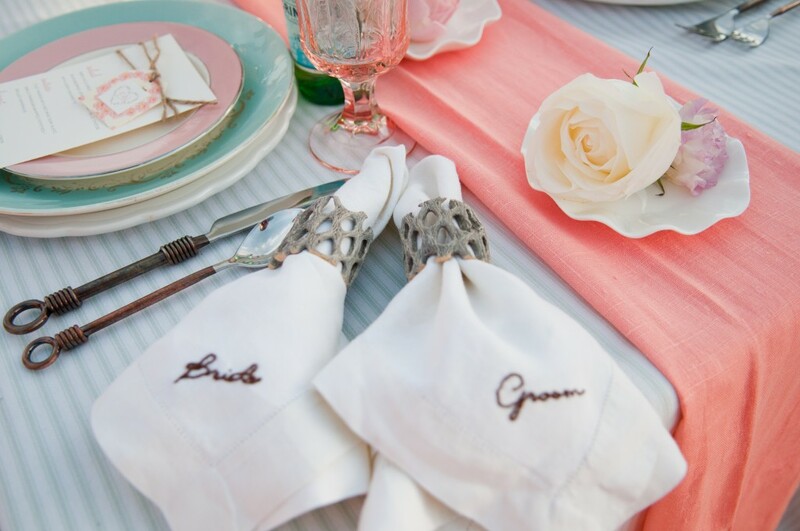 **If you are a wedding professional and would like your clients to participate, go here to find how you can spread the word.